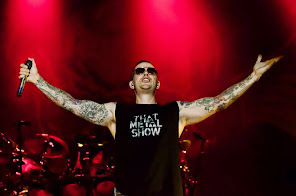 Avenged Sevenfold News: Fozzy's Chris Jericho about M.Shadows: "I think is a great frontman, he does a ..."
Fozzy's Chris Jericho about M.Shadows: "I think is a great frontman, he does a ..."
I think M.Shadows is a great frontman, he does a great job. Corey Taylor's a very good frontman, he's not afraid to go the extra mile to get people excited and into what's going on onstage. The basic tricks of a frontman all boil down to David Lee Roth, Paul Stanley, Mick Jagger and Freddie Mercury. It's the same concept. Like I said, not being afraid to be yourself and to go out there and just have a good time, man. And when you have a good time, it rubs off on the crowd. So then they feel the same way. As a frontman, you set the tone for the rest of the show. You set the tone for the vibe of the audience. If you're kinda a laid-back type of guy fronting a band, that's probably the type of reaction you're gonna get. But there's some people, that's what they want. Not for us. We want people to go nuts. We want people to chant, "Hey! Hey! Hey 1! 2! 3! ", and just throw their hands in the air. That's what we want. We've gotta put on a show.